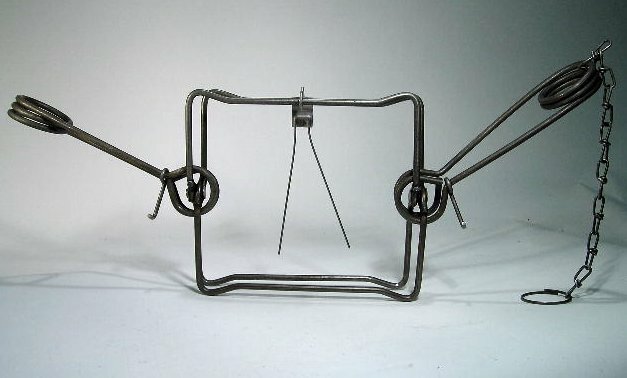 TRAP DESCRIPTION: 10" x 10" square heavy steel trap which has two springs for strong setting. The springs are in the shape of a "V" and when set, compress the tops of the "V" together. There is a safety latch on each "V" so that once compressed, you can latch it for holding it set. Once both "V"'s are compressed, you set the key into the groove of the trigger. Now, place the trap where you want to make the set. Once in place, the safety latches are released and the Bodygrip is now ready to work. 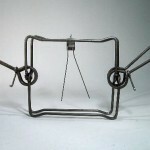 Because of the strength required to compress these "V" springs, it is strongly suggested that you get a set of Setters. These will enable you to compress the springs with a lot of leverage and make working with 330's much easier.